How heavy is that canon? Super-hero comics and soap operas have the same problem -- they stick around so long, through so many writers, with so many unbelievable, Earth-shattering plot twists, that after a while they start to collapse under the unbearable burden of their history. Part of what makes a story powerful is the sense that the events within it matter to the characters. That's easy to do the first time a soap-opera star or super-hero faces a deadly illness, or meets their evil twin, or saves the world, but after the third time? Or thirtieth? The effort of keeping the past straight, of having to deal with the (lack of) repercussions of all of those major life events acts like a sort of air-brake, dragging the stories down into complete irrelevance. The big publishing companies are, of course, aware of this problem, and unlike soap operas they have the luxury of just snapping their fingers and "ret-conning" the entire universe back to zero and starting over, making the characters once again interesting as they face "new" challenges and stories. At least, new this time around. As an added bonus, they've been able to expand their franchises to an entirely new audience via the movies, where once again the characters get an entirely new treatment by an entirely new writing crew, reinventing the entire concept. In a weird kind of feedback loop, the energy from the fresh audience and story of the movie revitalizes the comic, and vice versa, so you have Bob Kane's Batman inspiring the insipid TV Batman inspiring Frank Miller to go back to the original Dark Knight inspiring Tim Burton's darker movie version which inspired Bruce Timm's darker animated series which gave rise to ... you get the picture. Literally. But the older you get as a fan, the less power this bait-and-switch has. We've been through so many Infinite Ultimate Multiple Crises on Every Earth And Then Beyond Again massive multiverse-ending crossovers that having to sit through one more seems like a joke. Batman gets another partner again, again; Spider-Man's a teen again again, then married again again, then not married again again ... stop already! At some point the weight of the canon cannot be offloaded onto us any longer. Enough is enough. Which brings me to "Invincible". When I sit back and really think about it, I have to admit that "Invincible" brings nothing truly new to the table. At heart it presents a classic super-hero tale, almost a throw-back to the kind of senseless, random fun you got out of the Golden Age, combined with the bloody grit of the Nineties. Which at most is a combination of a bunch of old stuff, and yet it's my favorite comic book being published right now. Why would I like this particular bunch of old-as-new and not the reams of other, more established characters and titles? In short, it's because it's good, and it's uncanoned. I'll take the last one first, because I made the word up and so owe it precedence. To be uncanoned means that it starts fresh, with no expectations and no history at all. New characters in a new setting with a new creative team, with no ties to pre-existing universes or timelines. The freedom this gives the artists and writers cannot be overstated. No matter how great a writer you are, when you sit down to write a Superman story, you've already got a massive load to carry before you even begin. Even John Byrne, when he set off on the "Man of Steel" ret-con, couldn't really get away from the basic history, characters, settings, costumes, and plots. There's just too much cultural and historical baggage there. Robert Kirkman, on the other hand, gets to do whatever he wants, because he made up the whole world. Yes, the elements have all been gone over thousands of times in the past, but he gets to combine them however he likes. Ryan Ottley can design whatever outfits he desires because the vision is his (and Kirkman's obviously). The reader doesn't bring pre-existing expectations to the book! All they have, all they can come away with, all they can get from the reading experience is what Kirkman and Ottley put on the page. That's it. The ink is the alpha and the omega, baby, with the reader's imagination the blank page. You can't do that with Spider-Man or Superman or Batman, every single reader (or viewer in the case of the movies and television) comes into the experience with a set of expectations and knowledge that exist before they ever sit down. As a creator, you've got to deal with that. When you start fresh, though, with a whole world like the Invincible team, your work is taken on its own merit. What you draw and what you write stand or fall on their own. The shortcuts are few and far between, because while you can rely on the big established archetypes (big strong guy, alien invasion, team of spandex-clad adventurers, etc. ), while that overall space is pre-defined, what lives and breathes in it is not. Being uncanoned, of course, cannot stand on its own. After all, I've been going through the Nineties Image stuff and I can tell you from bitter, eye-gouging personal experience, simply being able to start a new title does not guarantee it will be good. Far from it, as page after crap page so graphically illustrate. It's not enough to be uncanoned, you have to also be good. And Invincible very much is. Unfortunately you can't get a very good sense of Kirkman's stellar writing online, but you can sample Ottley's art on his web site. His characters are a great blend of classic comic-book super-hero infused with an animated cartoon style. Everything works in the world that's been established, from the design of the backgrounds and buildings to the costumes to the facial expressions. Everything bears the team's conscious design decisions. These are guys who are well-versed in comic book history, who understand the toolset they've been bequeathed, and who know how to use those tools to do exactly what they want. Rob Liefeld and the Image guys from the Nineties, on the other hand, seemed completely oblivious to everything except the most superficial elements of the medium. They didn't understand that the glitter and the muscles and the guns were tools to be used in telling the story, not the story themselves. They were slaves to their tools, instead of being master of them. The difference is stark. Those Image books are a mess from top to bottom, page after page of inane writing, cluttered layouts, muddy colors, jaw-dropping missteps, elementary mistakes of anatomy, and a complete cluelessness about what it means to be a professional. They were comics created by fanboys. Invincible starts at the same place -- a blank slate -- and in the hands of people who really understand the medium and their tools it comes to life. 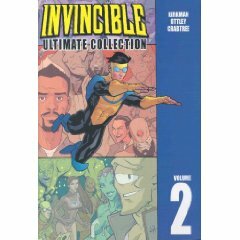 The sad thing is, eventually I know that Invincible too will begin to sag under the weight of its own history. I think sometimes the Brits have the right idea with the way they run their TV series, keeping them to very short runs of just a year or two, not letting them age to the point of complete inanity. Neither American super-hero comics nor American soap-operas have figured that out yet, and someday Invincible will follow suit. But until then, I'm sure enjoying the ride. Whenever I go to the comics shop and get my stash for the week, I get the same tingle of excitement on seeing "Invincible" there that I used to when I was a kid and Dad would bring home a big stack as a special surprise. That's the mark of a great piece of art, and I thank Misters Ottley and Kirkman for bringing the love every month. Here's hoping it's a long, long time before that canon gets too heavy! 8 Responses to How heavy is that canon? Thank you. Touche’. Invincible is fun like crazy. Like with the Teenage Mutant Ninja Turtles comics, the creators can do whatever they want with the characters and their world(s) while keeping them consistent. The tried and true heroes don’t never needed a revamp, just good writing. Presentation’s just as important. Nice link, Jeff. I’m not much for animated style in comics, that stuff belongs on the tv, but his other drawings are pretty good. On the other hand, ignoring the continuity can be just as bad. I quit collecting when, after a period where my comic provider was back order canceling everything I requested, I finally caught up on issues only to find out that all the X titles had “skipped ahead” in story time. The team rosters had changed, plot lines had been abandoned (and as far as I know, still not resolved) and I was dumped into new ones that I didn’t care about. I wasted an embarrassing amount of money to find out what I had missed, only to find out it didn’t matter anyway. The whole thing annoyed me to the point I quit completely. Even now, I really only buy by trades where I can be sure of getting a complete story. I haven’t tried (or seen to try) Invincible. I have tried to start out with new companies, with their own “universes”, but they don’t tend to last. I tend to wait for trade paperback collections too, Bael. Although once I get caught up and hooked (as happened with both Invincible and Fables) I do pick it up monthly. But even then, for really good ones I like to get the TPB editions when they come out, it’s just really convenient and a different reading experience. You echo my own feelings exactly. I started reading and buying comics when I was ten, back in 1957. I didn’t mind when DC came up with a revamp of the old Justice Society, but I did have a sense of impending doom! I managed to hang in there until they started gobbling up some old 40’s and 50’s characters and I quit when they hit the Crisis! I may be soooo retro, but I just can’t stand what they’re doing to the characters and storylines now!!!! Ahhh, if there were only some way to undo it all! i had more than 2800 comicbook issues…then some kids broke in where they where stored and stole most of them, others they poured oil on and what they did in my pile of x-men i dont like to think about..now there is this whole universe 1 universe 2 etc so i dont pay much attention to the serials anymore. as for the movies beeing made: i like some of the movies.. but almost everyone of them are the same: iron man vs iron man sequel: ironman vs iron men, hulk vs hulk, spiderman vs venom (the last movie i really liked) the spirit kinda sucked, if i want to see my hero fleshed out i want it to look real… (not realistic certainly, just not like a comic book with actors)still most movies are really good!